the benefits of all the intervention policies outweighed the harms, between 6 and 24 times. However, there were order-of-magnitude differences in estimated net benefits among policies. A universal approach to bicycle-friendly infrastructure will likely be required to achieve sufficient growth in bicycle commuting to meet strategic goals. 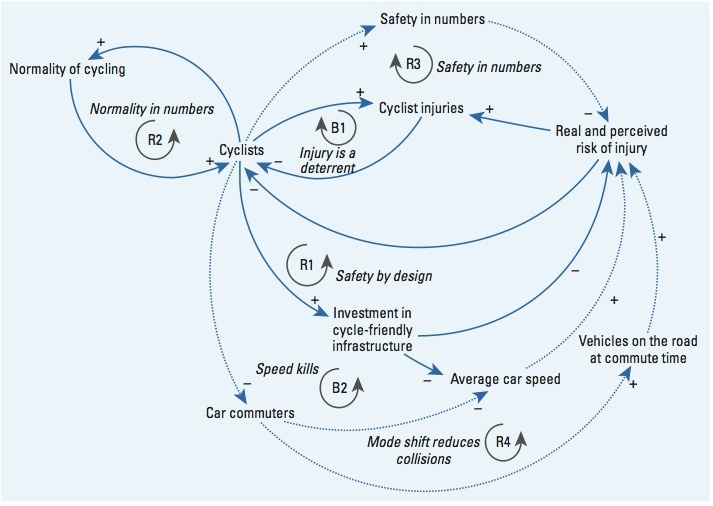 The researchers employed a system dynamics modelling approach that incorporated feedback loops between infrastructure provision and street design, people’s travel behaviours, and actual and perceived safety. As a transport economist, I found their methodology incredibly interesting. It illustrates how you often need complex modelling tools to quantify things that are intuitively quite simple. In this case, the fact that if you make every street safe to cycle on, people will choose to get on their bikes. Right now, Auckland’s obviously not doing too well when it comes to complete cycle networks. 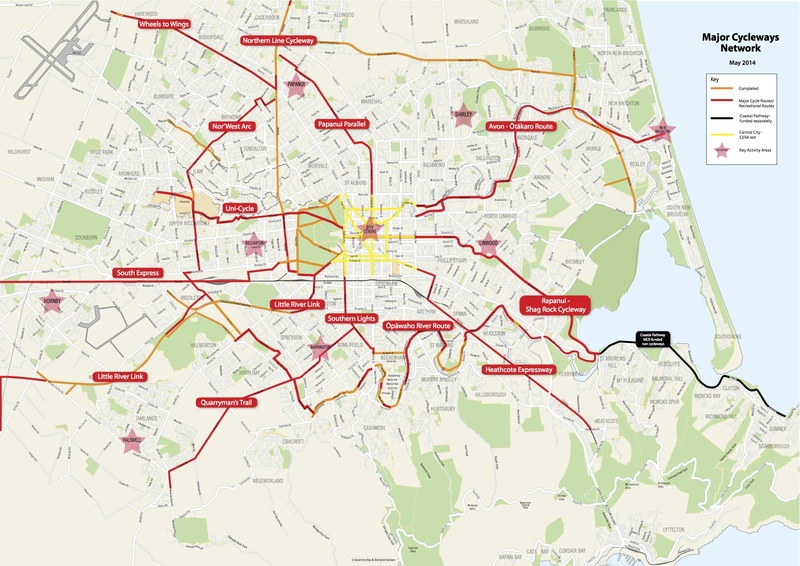 If you look at Auckland Transport’s online cycle maps, you’ll see some streets with strips of green paint down the side, and many more that you could in theory cycle on (if you were especially bold). However, we’re lucky enough to have a local example of a city that is rolling out an ambitious complete cycle network. Since the 2011 Canterbury Earthquakes, Christchurch has planned a network of 13 major cycleways that will extend throughout the city, a re-jig of its city centre street network, and a new street design manual that will deliver better on-road cycle facilities. (Disclaimer: I have previously worked on the An Accessible City project as a consultant.) And they’re planning on getting it done over the next five years. It’s going to be interesting to watch Christchurch over the next few years. I expect they’ll provide a good example for a lot of other New Zealand cities. So did it pan out in Christchurch? And if it made some progress, how has the road building undermined that progress? It’s not finished, nor will be by 2019 as suggested it would be in the original article. Yes there has been a lot of bikelash but in general the entire rebuild in Christchurch is dragging its heels, so who knows when this will be completed or even how much of the plan will happen. Progress has been made though. And Christchurch council recently acquired and demolished houses at the end of two cul-de-sacs that backed on to each other to allow the Quarrymens cycleway route to be built. Even then that was done because of the backlash raised by residents over removing on street carparks from the preferred route. So they did the backroute instead and demo-ed two houses. Still even that is something AT has not ever shown it has got the balls to do. So at least someone in Christchurch council is not afraid to stand up to the cars first brigade. It would be great to see a city in New Zealand on the otherside of the post bikelash vengance. Stuff commens are generally vile anti cyclist rage & fury at the moment. Has anyone followed what the social media has been like in the cycling pilot study towns of New Plymouth and Hastings? Given the focus of NZTA, the Councils and the University of Victoria, with such good data to show the benefits of the cycling studies, I’m interested to know if people have been able to subdue the hotheads with great facts. Or with anecdotes of happy children. I went to feilday yesterday there were heaps of electric bikes and mopeheads dirt bikes on display. I was expecting to see some electric quads but no signs. Anyway one of the lithium batteries had being opened so you could see the workings. Heaps of electronics along with the cells so they are not simple. I wonder if the electronics was just for battery control or maybe its speed control as well. The drive home was a nightmare I should have taken the intercity to Hamilton and caught the shuttle. Next time however I am not happy with intercity at the moment because they won’t use the beautiful new bus station at Manukau. /does anyne know if the use of the bus station by interCity and Naked bus is going to occur? Is there any plans for interconnection between AT services (train and bus0 at Manukau for these two services. Yes all the coaches will use the station. Mana/Naked have been using the Manukau bus station since Sunday 18 April 2018. Intercity, for some strange reason, are still using the old bus stops outside Westfield Manukau, I guess they’re quite happy to have their passengers waiting outside at night in the wind and rain, with no security, toilets etc. Got told some/all of their new buses baggage doors didn’t align to the gates in the fence so waiting on sorting that through. Hi Royce, as it happens I took the bus to Fieldays last week (Mana both ways, down on Wednesday afternoon and return to Auckland on Thursday night after a day at the show). Very comfortable, especially the downstairs seats with tables, and cheaper than Intercity as well – and yes, they do use the Manukau sawtooth terminal. You should absolutely give it a try next time.